The Peavey PV-10BT Stereo Bluetooth Mixer The Peavey PV 10 BT includes 4 channels of reference-quality mic preamps with 48 volt phantom power, 4 direct outputs for recording, full featured stereo channel and media channels with Bluetooth wireless input allows seamless connection to almost any "smart" device, high quality digital effects with LCD display. Channels have 3-band EQ per with bypass, exclusive Mid-Morph EQ on the mic channels, switchable high-pass filter, channel mute buttons, channel solo, aux send, signal clip indicators, 2 channels of compression, on board selectable guitar preamp with 1 Meg Ohm Hi-Z preamp and special guitar EQ curve. 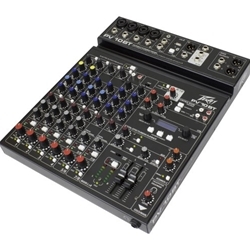 Streaming USB out with USB return to mains and or control room., MP3 file playback via USB A input, Peavey's exclusive Kosmos audio enhancement, dual selectable control room outputs, and a stereo master LED meter bridge, 60mm master faders and XLR main and monitor outputs.